I've been wanting to make a series of prints about money for a long time, maybe since 2007 when Lynn and I experienced something of a reversal of fortunes and decided to downscale our lives before life did it for us. My usual approach to art making, researching a topic until I feel I have enough understanding to begin, didn't work this time. I audited a class on the history of American economics which did nothing to inspire me, and my own ambivalent feelings about money also didn't help me. But I've finally found a way in to the topic, a way which is purely visual. This new series, called Loaded, is based on a simple conceit. Each print begins with an image isolated from the back side of a one dollar bill as the starting point. In the first print, Great Wave, the wave design came from below and to the right of the pyramid motif. For this print I've worked with a tiny crop that includes the word "god" from the "in god we trust" motto at the top of the bill. The words "in god we trust" have appeared on American coins since 1864, but have been written on paper currency only since 1957, and the words are controversial, as are all things having to do with religion in the United States. As I worked with the image, at first all I could see was the cynical view that we in the U.S. actually worship not God but Money. Which is certainly true in many ways. But then I began to think about all the ways that money perhaps is sacred: the trust we have in each other and in our economic system that is essential to its functioning, the hopes and dreams that we all hold and that money can help us attain, money as a symbol and exchange for honest labor, money offered to another out of a desire to help and serve. This morning, when I pulled a couple of dollars out of my wallet at the post office to send my mother news clippings about flooding in her beloved home state of Vermont, that was love in the form of money. These have been my thoughts as this print emerges. 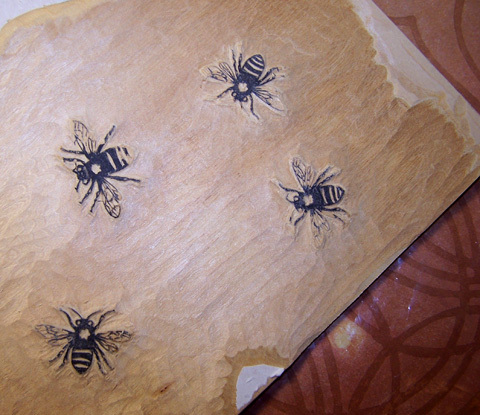 Today I'll be adding the bees I carved yesterday. Carved some bees today, which I'll print tomorrow. I spent the past 3 days at Zea Mays Printmaking in Florence MA at a silkscreen workshop taught by Jennifer Cooke of Raeburn Ink. It was a really fun workshop and I was very surprised to discover that I could make silkscreen look like watercolor by using extender in the inks. Here's one of the pieces I made at the workshop. This is another shot of my current print in progress. There are 8 layers of color shown here, printed with a mostly uncarved block of plywood (just the little "stars" are carved). Now I'm carving more on the same block to create a design that will be overprinted. This is the second print in my series about money. The series is tentatively titled "Loaded." I'm going to be taking a silkscreen workshop at Zea Mays Printmaking for the next 3 days so I won't be working on this print, but I'm excited to try another printmaking method. I can imagine silkscreen and woodblock being super compatible. I started working on a new print last week. It's another full-sheet print, so the paper is about 25 x 38 inches (63.5 x 96.5 cm). I'm trying another new-to-me type of paper, this time a machine-made paper I bought from Hiromi Paper called Shikoku White. So far I've applied 5 separate all-over overprints of color, so the paper is taking quite a beating but it's holding up under the baren as long as I use an ategami (a protective backing paper used under the baren to keep the print paper from abrading). It's a thin paper, but not as thin as the Kizuki Kozo from Japanese Paper Place that I used for the Great Wave print. The photo at the top is how the print looks after 5 applications of color. I shot the photo while the paper was still wet, which is why it looks wrinkled. I've done all of this with a block that's basically uncarved. The only carvings are the little "stars" which I carved out just so I could know where they're located. I've used yellow, red and blue on top of each other to allow a complex color to emerge. I've been surprised to see that the grain reacts differently to each pigment. Below is a closeup of the grain beginning to show through. I expect that there will be at least 10 more color layers, and soon I'll begin doing some carving. The 2011 installment of an ongoing series in which I track the state of my own gay marriage. I’ve made an updated version each year to celebrate my wedding anniversary, August 15, 2004 — the first year that gay marriage became legal in Massachusetts. Someday this will be a one-color print. See the whole series on my web site.